Festival season is here! AKA break out the crop tops and faded sunnies. But let’s be honest: by the time you buy your ticket, arrange accommodations and plan out your perfect festival ‘fit, it can be hard to splurge on the finishing touches. And yet, we all know that festival hair and makeup MAKE the look! How are you supposed to ‘gram without rocking some colorful eyeliner and a flower crown?! Have no fear, team Goody is here with 3 hair accessory DIYs that will give you all the festival flair with none of the fuss (and without breaking the bank)! We’ve all seen the trend of rocking bobbies in fun hair patterns and colors, but unreliable bobbies can slide or color can wear right off. If you’ve spent all this time and money on the perfect outfit, you deserve a custom selection of colored bobbies to tie your look together! Step 1: Get bobbies you can trust. Goody SlideProof Bobby Pins are guaranteed to hold up in the festival heat. No sliding styles here! Step 2: Pick your paint colors. We prefer to use paint pens ((all about those vibrant neons)) to paint our bobby pins. Plus they’re less messy than acrylic paints. Step 3: Let dry. Paint on your favorite colors and let dry, then seal them up with clear nail polish so the color stays even under the harsh desert sun! TIP: Use a holographic or glitter clear nail polish top coat to add a little extra glam to your creations! Step 4: Accessorize! 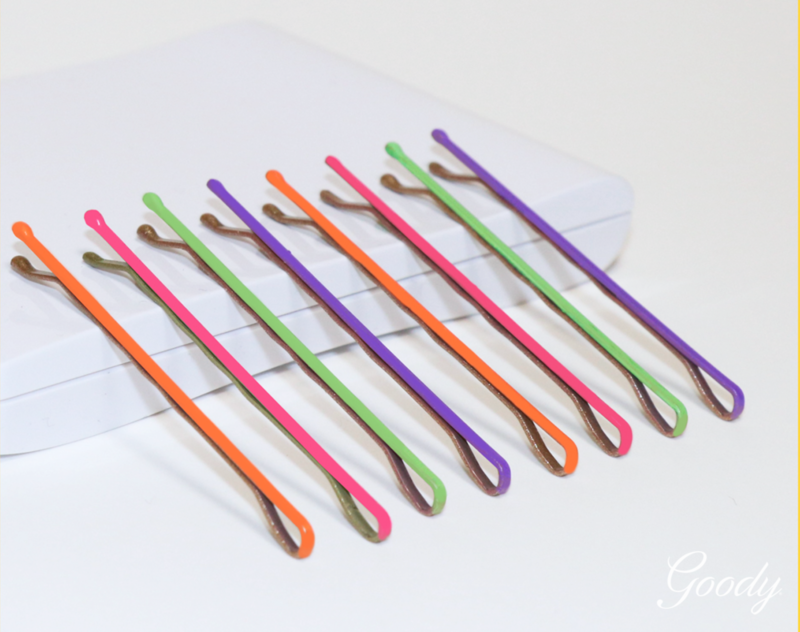 Create fun Bobby Pin Art with your new DIY colored bobbies! We LOVE to accessorize with hair gems, but their hold is as dainty as their look. After rocking out to your fave artists, you’ll have head-bobbed the jewels right off your head! Enter SlideProof Bobby Pins: a sure-fire way to keep your hair gems perfectly in place all day/night long AND secure your style! Step 1: Gather your supplies. Pick up a pack of Goody SlideProof Bobby Pins HERE. We have different colors and sizes for any hair type. Then make your gemstone selections - You can mix it up with different shapes, sizes and colors to match your outfits! We love THESE long gemstone crystal beads! Step 2: Get gluing. Plan out your crystal creations so you have them ready to go when you glue. Then, simply hot glue your gemstones to the flat part of the bobby pin. TIP: always wear the grooved side of the bobby pin against your head as this provides the no-slip hold. Step 3: Let dry. It’s important to let your creations FULLY dry before trying them on! Steps 4 & 5: Admire & Accessorize! Choose the hair jewels that match your outfit best and accessorize. Pop your new creations into braids, in the back of a half up style, or on top of your head if you’ve thrown your hair in a pony! The flower crown is a festival classic, but can also be one of the heavier hair accessories to sport when hopping from stage to stage. Here’s our easy breezy DIY hack to flower crown magic. Step 1: Get a pack of Goody SlideProof Xtra Thin Headwraps. THESE headwraps are thin and secure. We also have Braided Headwraps for a fun boho look! Step 2: Pick your flowers. Chiffon flowers are a great lightweight option that are easy to DIY with, and light to wear. Step 3: Get clipping! No hot glue needed! Simply clip on the flowers you like to piece your flower crown together! Step 3: Rock your creation! DISCLOSURE: Goody may collect a small share of sales from the links provided from this Amazon store link below.